On the 18th January 2019, the Tiedekulma building in Helsinki, Finland, was full of curious and enthusiastic people from various universities, companies and all other stakeholder groups. 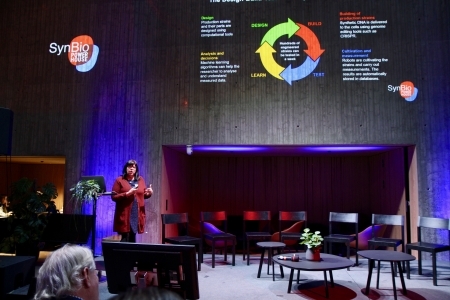 Synbio Powerhouse - the operator of the innovation ecosystem in synthetic biology in Finland had the official grand opening event with over 100 guests and 12 speakers. Synbio Powerhouse is a VTT driven ecosystem in Finland for everyone involved or interested in synthetic biology. Synbio Powerhouse is managed by co-creation manager Tuula Palmén from VTT and Professor Merja Penttilä (picture above) from VTT and Aalto University. The importance of collaboration between companies in the ecosystem was highlighted in the launch event by many speakers and panellists. Sampo Lahtinen from Kemira introduced different strategies, how synthetic biology can create value more and more in the future. Production steps can be replaced with enzymatic ones. Visions for collaboration were not limited only to production steps, but included also team work within different fields of science. Jussi Manninen from VTT and Samuel Kaski from Aalto University both mentioned, that we should take advantage of Finnish expertise in IT, especially in artificial intelligence and machine learning. Michel Manach (picture below), the Business developer of Toulouse White Biotechnology (TWB) consortium, provided a great success example of TWB and highlighted the EU level collaboration of the IBISBA network, partners of which both TWB and VTT are. Finally, Sini Harkki from Greenpeace Nordic and Sirpa Pietikäinen from EU parliament reminded about the urgency of the climate change and synthetic biology is one promising technology to be a part of fighting it.